If your tree falls onto a neighbor’s property, it might not make a sound, but you may be liable. Trees can fall for any number of different reasons: construction, heavy storms, and even just the natural end of a tree’s life. Often, a tree on your property will crash into your neighbor’s property as a result of building or construction on your property. If, as a result of your own negligence while performing construction on your property you knock over your own tree, you will likely be held liable for the damage to your neighbor’s property. Even if a construction contractor you hired is the one who caused your tree to fall, you may still be held liable, as long as your neighbor can prove that your negligent direction led to the tree’s demise. However, many licensed contractors will have liability insurance that will cover these sorts of damages, so you may not have to. Trees are often tossed around like matchsticks in a heavy storm, and a solid lightning strike can slay even the healthiest tree. 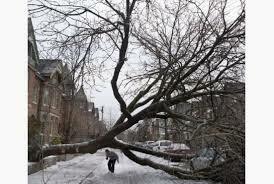 Homeowners are generally not responsible for extreme natural conditions that cause otherwise healthy trees to fall onto a neighbor’s property. These “acts of god” (also called “force majeure“) are outside of a homeowner’s ability to predict or prepare for, and damage from these natural events is typically not a homeowner’s responsibility. However, if an old or diseased tree rolls into a neighbor’s yard after a slight gust or light storm, the tree owner may be liable. Why? So if you failed to make reasonable inspection of your property, and a diseased or dying tree tips onto your neighbor’s land, you’re likely to be held liable. This is especially true if your neighbor has alerted you to the dangerous condition of the tree. Take good care of your trees, and you should have much less liability to worry about when they fall.